Churchill’s famous quote is less applicable to Putin’s Moscow than it was to Stalin’s, but the national ability to puzzle observers is now characteristic of Kim Jong-un’s Pyongyang. For decades, North Korea was a hermetically sealed society with intelligence analysts reduced to the equivalent of ancient Greeks attempting to decipher Delphic oracles or Romans examining animal entrails seeking omens. But suddenly, there is openness. Almost as if Kim Jong-un had hired a world class PR firm under instructions to project sunshine. Gone are the creative slanging matches on the level of my “button” is bigger than your button. Or threats to annihilate everyone within range of his growing nuclear missile force. Matched by countervailing threats from Washington to lay waste to the DPRK if it sneezes. Instead, we are on the verge of an historic effort by Pyongyang, Seoul, Beijing, Tokyo, and Washington to unlock the 70-year deadlock that has characterized the Korean peninsula since the end of World War II. But not without twitches equivalent to diplomatic indigestion from Pyongyang. We do not know, for example, anything regarding the two trips Kim made to Beijing (the only out-of-country excursions he has made). We know nothing substantive of the two visits Secretary of State Pompano held with Kim. Nor of the content of the sessions between Kim and ROK President Moon. Nor of the meeting between Kim and Japanese PM Abe. If we wanted to hypothesize, however, we could put money on PRC leader Xi being a quiet central figure in the evolving scenario. Where the talks will be held (Singapore). But President Trump is uncertain the talks will go ahead. If they do, here is an outline of what the positions of the different parties. A Treaty ending the Korean War without cost to Pyongyang. An end to Pyongyang’s threat to the ROK. What Does ROK President Moon Want? Leverage from diplomatic success with NK to play in U.S.-PRC bilateral issues. What Does Japanese PM Abe Want? Return of Japanese citizens kidnapped by Pyongyang to tutor NK espionage agents. And Who Is Likely to Get What? At this juncture, Kim appears a big winner. He has surrendered virtually nothing; returning three U.S. citizen pawns bought him good PR. The commitment to eliminate his nuclear test facility (which some believe was irreparably damaged during testing) is trivial. Kim has no need to test further; he has proven nuclear capability. And, after all, how often has Israel tested? 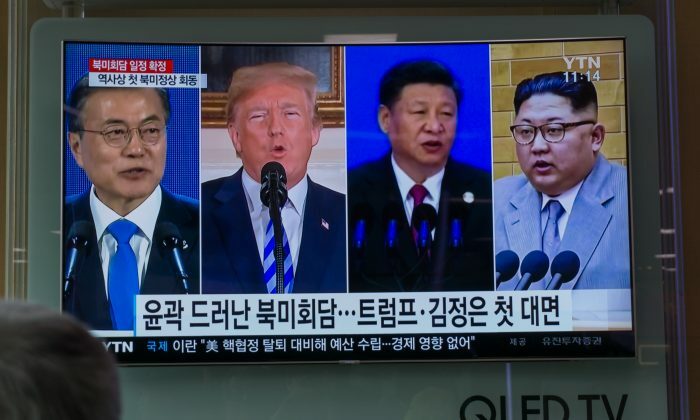 Moreover, he is sitting as an equal to the United States—without (apparently) concurrent participation by the ROK, a longtime U.S. desiderata. Agreeing to a treaty to end the Korean War officially—even a statement to “begin to commence to start” (with detailed texts still to be drafted/negotiated) would enhance regional stability. But other U.S.-desired takeaways, e.g., Kim’s commitment to eliminate all nuclear weapons and missiles is sun-rising-in-the-west unlikely. Major agreements can start in two ways: a high-level joint announcement as a kick-start to negotiations (top down) or a painstaking line-by-line construction of document text for final agreement at high-level (bottom up). Clearly, the June 12 session will be a “top down” opener for future discussions. Nevertheless, it may well suffice to accord President Donald J Trump a Nobel Peace Prize (with Kim Jong-un standing beside him as a joint awardee).